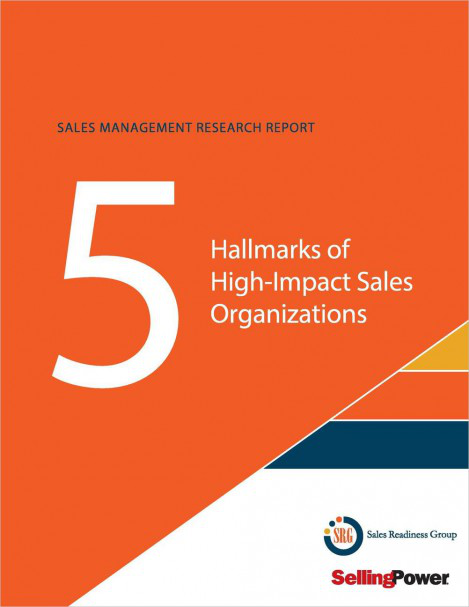 SEATTLE, WA — July 18, 2017 – A new report, 2017 Sales Management Research Report: 5 Hallmarks of High-Impact Sales Organizations, published by Sales Readiness Group and Selling Power, shows that high-impact sales organizations tend to invest more in sales manager development. Such investments lead to higher quota attainment and win rates. However, 45 percent of respondents reported they have insufficient resources or budget for the development of their sales managers. Show more proficiency at managing sales performance. Earn their teams’ trust and respect. While most sales organizations recognize the leverage their managers can have on their teams’ performance, less than 20 percent of sales managers participate in sales coaching programs. In fact, the biggest impediment to implementing a sales management training program was (according to 65 percent of respondents) competing priorities. The insights in the report are based on self-reported answers provided by 400 respondents in more than 20 industries. Companies and sales organizations of all sizes are represented, and 44 percent of respondents are from companies that have more than $51 million in annual sales. A little more than half of all respondents have the job function of sales leader; 45 percent list their role at the level of director or above. Respondents’ organizations carry quotas ranging from less than $250,000 to more than $2 million; 47 percent have annual quotas that exceed $500,000. Sales cycles vary from less than one month to 12 months or longer; 57 percent have an average sales cycle of between one and six months. The intent of the report is to highlight the key role of sales management. Selling Power has been publishing content about sales management since 1981 in its award-winning flagship periodical. The principals at Sales Readiness Group have spent more than 20 years helping sales managers create elite sales organizations. Their insight helps sales managers achieve the necessary perspective to realize short- and long-term goals, learn vital management skills, and avoid common pitfalls. In addition to Selling Power, the leading digital magazine for sales managers and sales VPs since 1981, Personal Selling Power Inc. produces the Sales Management Digest and Daily Boost of Positivity online newsletters as well as a five-minute video series featuring interviews with top executives. Selling Power is a regular media sponsor of the Sales 3.0 Conference. Contact Selling Power headquarters at 540-752-7000. Sales Readiness Group (SRG) is an industry-leading sales training company that helps companies develop highly effective sales organizations. Their solutions include comprehensive sales training, sales coaching, and sales management programs that deliver sustainable skills improvement. SRG has been in Selling Power magazine’s Top Sales Training Companies list for eight consecutive years. Contact Sales Readiness Group at 800-490-0715.